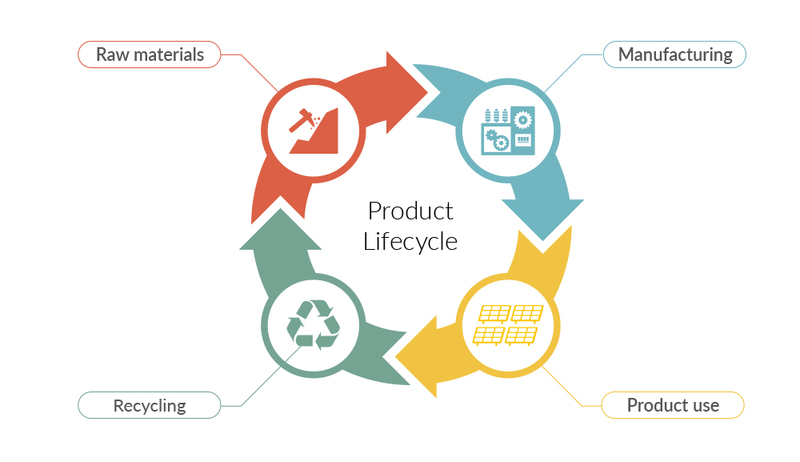 Life cycle analysis (LCA) provides an invaluable decision support tool for policymakers as a framework for assessing the environmental impacts of a product or process throughout its life cycle; from raw material sourcing to manufacturing, operations and end-of-life disposal or recycling. 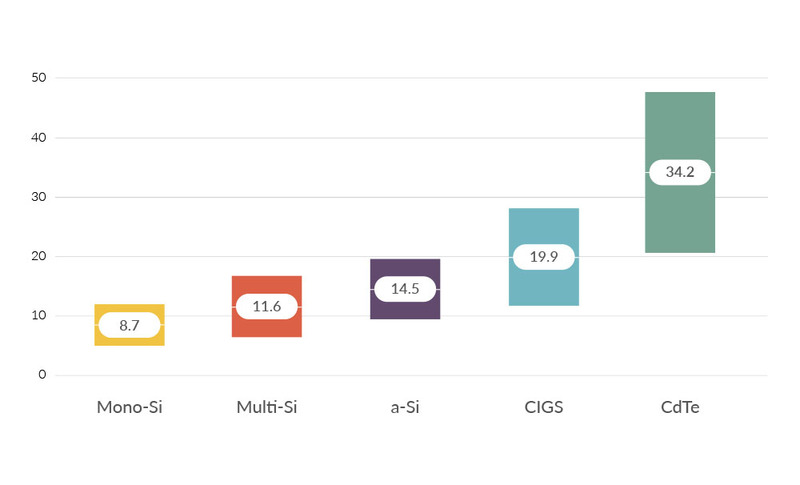 The most interesting attribute of these cells is their high conversion efficiencies, which can surpass 40%. These high efficiencies are obtained, however, at the cost of complex fabrication processes and cell designs and the use of rare elements. PV technology life cycle assessments show that electricity generated from PV has substantially lower greenhouse gas emissions compared to fossil-fuel based electricity generation technologies and that thin film CdTe and CIGS modules have a lower environmental impact than crystalline silicon technologies in terms of greenhouse gas emissions, air pollutants, ecotoxicity and energy use. Thin film PV technologies provide the industry’s ecologically leading solutions due to their low material consumption, efficient manufacturing processes and fast energy payback times. By using less electricity during production, thin film PV technologies generate the amount of energy required to produce them up to 3.5 times faster than crystalline silicon PV technologies. Energy Return on Energy Invested (EROI) is a metric used to quantify the amount of energy produced by an energy source system compared to the amount of energy needed to build and operate the system. EROI is a unitless ratio of the energy produced for society to the energy required to make that energy. An energy source with an EROI of less than 1:1 is not considered viable. Thin film PV technologies provide the greatest return on energy invested as they require less energy during manufacturing. Source: UNEP (2016) Green Energy Choices: The benefits, risks, and trade-offs of low-carbon technologies for electricity production. Report of the International Resource Panel. E.G.Hertwich, J. Aloisi de Larderel, A. Arvesen, P. Bayer, J. Bergesen, E. Bouman, T. Gibon, G. Heath, C. Peña, P. Purohit, A. Ramirez, S. Suh. Source: K. P. Bhandari et al., Energy Payback Time and Energy Return On Energy Invested of Solar Photovoltaic Systems, Renewable and Sustainable Energy Reviews 47, 2015. 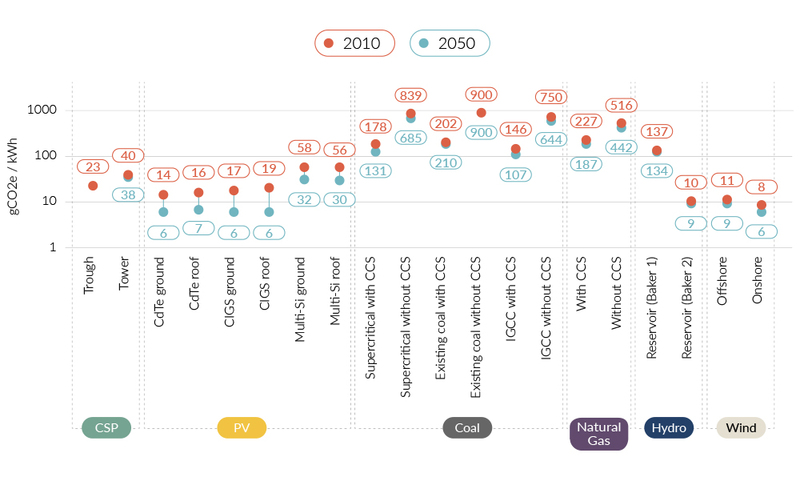 Policymakers have begun to incorporate PV LCA results in energy tendering systems. In order to award volumes to technologies with the lowest environmental impact, the French Environment and Energy Management Agency (ADEME) included carbon footprint assessment as a component in recent French PV tenders. As a result, the carbon footprint advantage of thin film PV technologies is increasingly translating into increased business opportunities. An EU Ecolabel tool is currently being developed to help professionals and consumers assess PV technologies based on reliability as well as technical and environmental performance. Thin film PV technologies contribute to a circular economy by providing a secondary use for mining byproducts that would otherwise be disposed of. Cadmium, gallium, germanium, indium, selenium, and tellurium are sourced as byproducts from the production of aluminum, zinc, lead, copper and coal. At the end of their 25+ useful lifetime, thin film PV modules can be recycled to recover glass and semiconductor metals for reuse in new thin film modules and glass products. With over 200GW of PV installed worldwide, proven high-value PV module recycling solutions are important for all solar technologies. In addition to PV Cycle, there are a number of innovative high-value thin film PV recycling initiatives operational worldwide that are helping to close the loop. First Solar’s high-value recycling process currently recovers over 90% of the semiconductor material for reuse in new CdTe PV modules and 90% of the glass for use in new glass products. First Solar recycling facilities are operational in the U.S., Germany, and Malaysia. Source: Keiichi Komoto, Workshop on PV Life Cycle Management & Recycling, Amsterdam, the Netherlands, 23 September 2014. 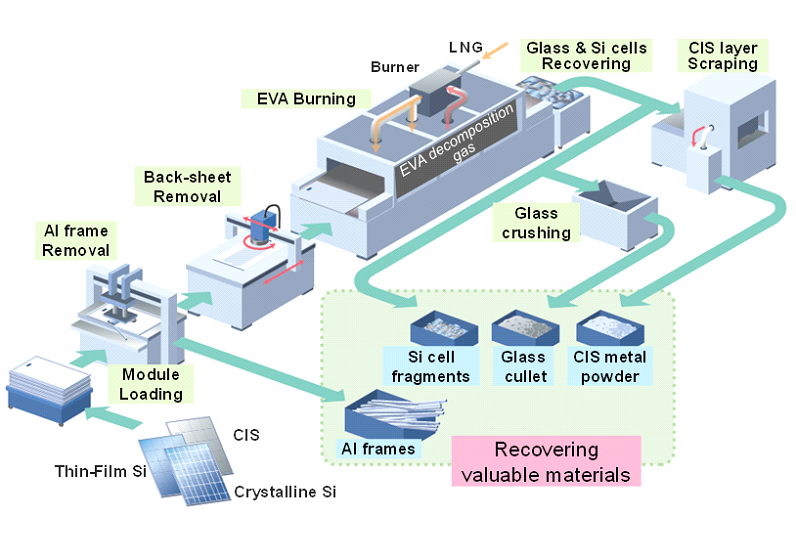 In 2014, Japan’s New Energy and Industrial Technology Development Organization (NEDO) developed an innovative PV recycling technology in 2014 which separates and processes various types of modules (crystalline-silicon, thin-film silicon, and CIS). The technology is currently in its pilot phase with a maximum annual throughput of around 12 MW for crystalline Si panels and 7 MW for CIS panels. The European Union’s Seventh Programme for research, technological development and demonstration is funding the EU RE-CLAIM’s green technology recycling project. 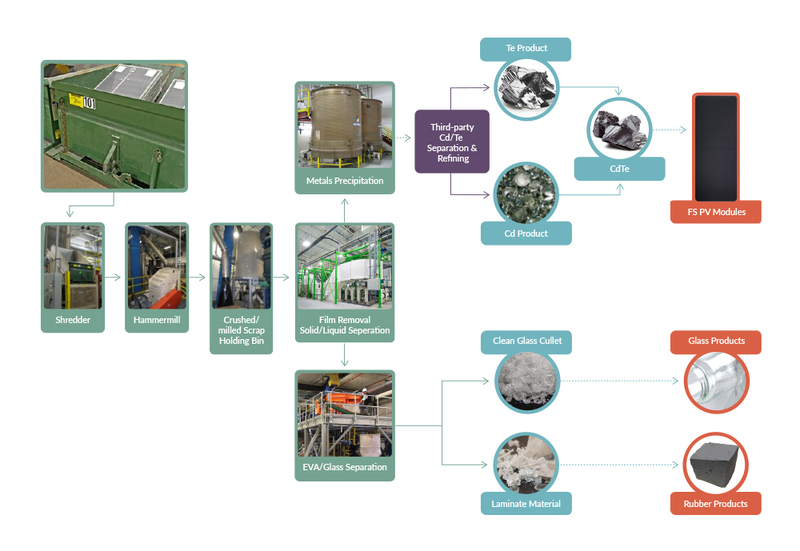 EU Reclaim is developing a high-value recycling plant pilot that can be applied in an industrial setting to contribute to a circular economy by recovering gallium, indium and valuable rare-earth elements used in PV technologies, solid-state lighting (SSL), and other electronic waste.